My adventure into the world of CAR PC's. My auto radio can play music from a USB stick, but I missed the ability to search for a specific track when I wanted to hear it. That, and the limited storage space finally pushed me into building a car PC. I had some specific wishes for the system which I wasn't sure I would be able to satisfy if I just went for a standard front end, so I decided to code my own using C#. My cars "theme" is red light (my sister calls it Santa's sleigh). I chose red since it does not mess up your night vision as much as other colours. My front end is therefore also mainly based on red items on a darkgray background. Uses Winamp to play audio, using the ActiveWinamp plugin. I've made my own search function/audio browser to feed it. Bluetooth serial connection to my cell phone using standard AT commands. It continously monitors signal strength and battery status, warns me if the battery is running low, and if I lose connection to the phone or network. If I get an incoming SMS it displays it, whereas an incoming calls displays the callers name (if known from the address book) and mutes Winamp. I haven't figured out how to switch to hands-free yet. 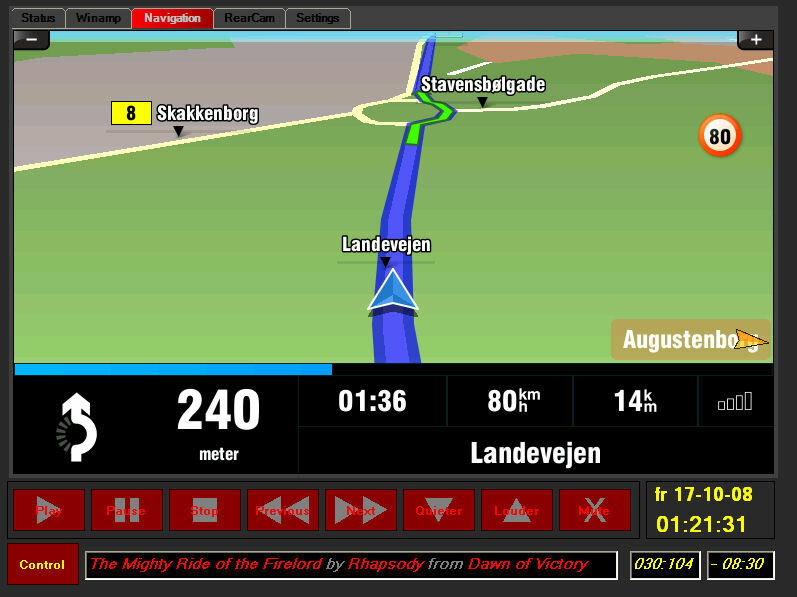 Navigation - using Sygic embedded in my application. 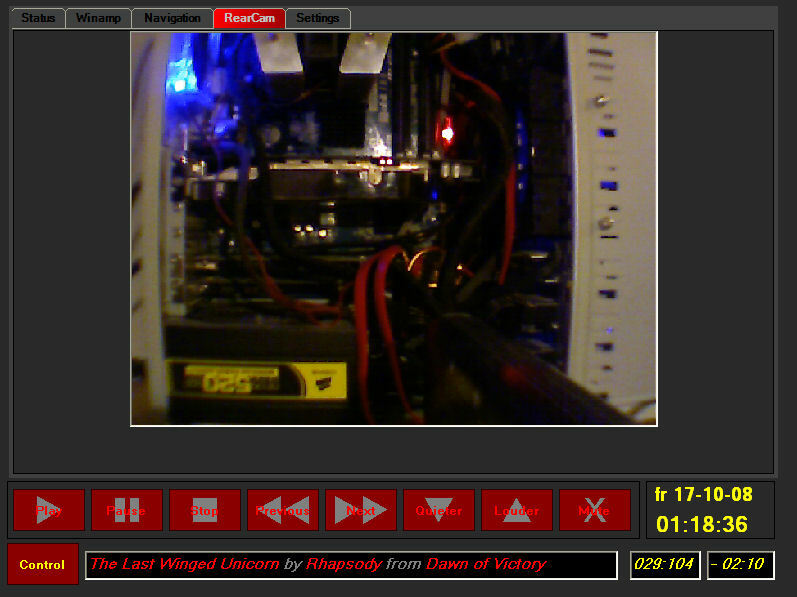 A standard USB web cam to help me when backing up. Interfaced using Brian Low's DirectX.Capture project. Warnings and information from the system is spoken using Microsoft SAPI 5.1 Text-To-Speech generation. There are still some issues related to hibernation/resuming, and the phone interface will most likely only work properly with a phone similar to my Nokia 6230, but so far I am quite happy with it. I will probably release the source code if anyone wants to have a look. The hardware parts of my CarPC setup aren't very interesting, it's just a standard PC with an old AMD Barton 2500+ in a standard midi tower loosely placed behind the passenger seat, the display is a CarTFT CTF845 8" touch screen suction-cup mounted to the wind screen, both powered by a 12-220V inverter. Well, there's also a messy little home made circuit to turn off the 220V inverter after the ignition has been off for some time (I drained the battery once too many before I added that) someone might find useful, but it will be replaced by a more advanced version soon anyway. The primary goal for me was to get something running, and then I can refine it over time. The status and information tab. 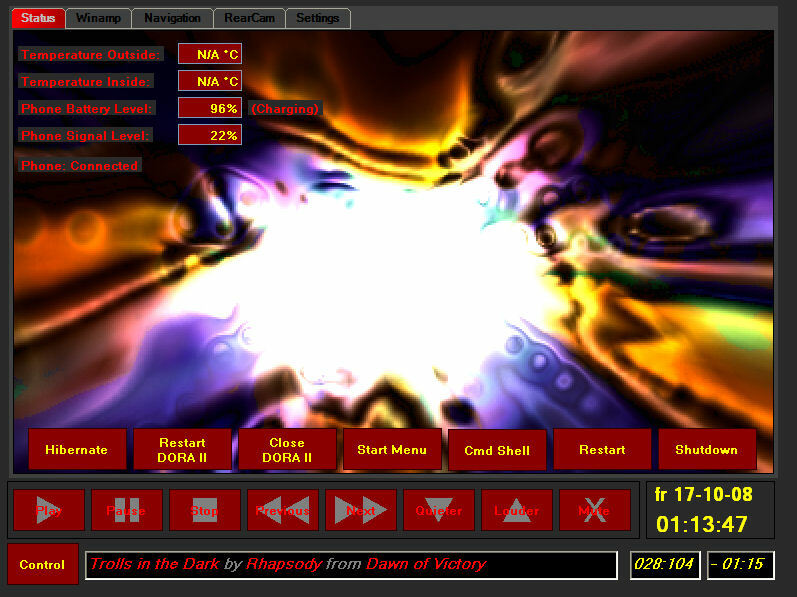 The background is Winamps visualization plugin window I've grabbed and embedded. This will be removed again, it's way to distracting when driving. 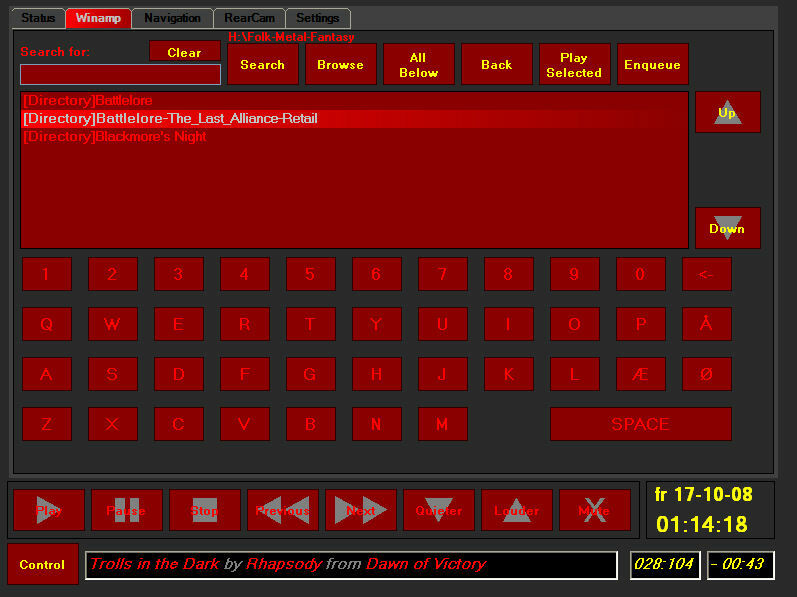 The audio search/browse interface with an On-Screen keyboard. The backup web cam tab.